In the summer 2011 edition of the Civic Society Newletter, Local resident Dr Philip Whitbourn wrote a nice summary of the history of the Park which we have been kindly allowed to reproduce here. Robert Marnock, one of the outstanding landscape gardeners of the 19th century, is well known to many people in Tunbridge Wells as the designer of Dunorlan Park. Less well known, but just as significant in its way, was his plan for the Grosvenor Recreation Ground. Dunorlan, of course, was not originally a public park, but the private grounds of one of the grand mansions that lined Pembury Road’s “Millionaires’ Mile”. In contrast, the Grosvenor Recreation Ground was Tunbridge Wells’ first municipal park, and was established to serve the industrial classes living at the northern end of the town. Opened in June 1889, the recreation ground is situated alongside the railway, which runs roughly north-south between High Brooms and Tunbridge Wells. On the accompanying plan (opposite), the boundary with the railway is on the lefthand side and, as may be seen, the layout falls into four main parts. At the narrow southern end, nearest to Grosvenor Bridge, Marnock formed a picturesque lake out of former reservoirs of the old Calverley Water Works. This survives intact, with its central island and the “dripping wells” or grottoes at its southern tip. To the north of the lake was an openair swimming pool, also formed out of an old reservoir, but this has long since been filled in. Then, moving further north, comes a level play area, where swings were provided for the children of the area. The open ground was originally intended for cricket but, in 1912, a bowling green was opened here, Sir Robert Vaughan Gower formally throwing the first Jack. A game then followed between members of the Corporation and the newly formed Grosvenor Bowls Club, which celebrates its centenary next year [thats's 2012]. Final score: Grosvenor Bowls Club 82, Corporation 62. At its northern end the recreation ground widens out, and the land gradually slopes down into a hollow, where two lower lakes were formed. These were separated by a bridge and a weir and they were a popular feature of a very beautiful parkland scene. Connecting the lower lakes with the periphery of the ground were a series of undulating winding paths On the higher ground above the lakes an octagonal bandstand was provided, to the designs of Henry Elwig. Sadly, both the lower lakes and the bandstand were lost to the town in the 1930s. Nevertheless, some of the serpentine paths survive, and the 1 930s also saw a huge expansion of the grounds by the addition of the Hilbert Recreation Ground, on the former Charity Farm lands. 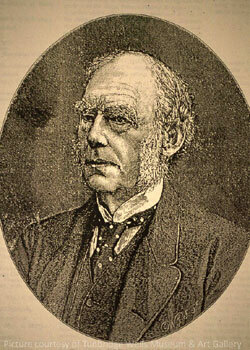 Robert Marnock (1800-1889) had worked with his contemporary Decimus Burton on the Royal Botanic Gardens in London’s Regent’s Park, and his other works include Alexandra Park in Hastings, and the grounds of Hall Place at Leigh, near Tonbridge. The Tunbridge Wells Recreation Ground was, however, regarded by Marnock as the best site with which he had ever had to deal. Download a PDF of the relevant pages from the Civic Society newsletter. Download a PDF of the full newsletter from the Civic Society.